There has been great enthusiasm for Aglow ministry recently following an Aglow national conference in Armenia that people from Nagorno Karabakh also attended. Pray for new leaders and members to step up in the call and vision to establish Aglow in Nagorno Karabakh. Pray for all the resources and creativity needed to fulfill the intentions of God in the nation of the Republic of Nagorno Karabakh. Background: Concrete numbers about the demographic situation in Nagorno Karabakh appear since the 18th century. Archimandrite Minas Tigranian, after completing his secret mission to Persian Armenia ordered by the Russian Tsar Peter the Great stated in a report dated March 14, 1717 that the patriarch of the Gandzasar Monastery, in Nagorno Karabakh, had under his authority 900 Armenian villages. A survey prepared by the Russian imperial authorities in 1823, several years before the 1828 Armenian migration from Persia to the newly established Armenian Province, shows that all Armenians of Karabakh compactly resided in its highland portion, i.e. on the territory of the five traditional Armenian principalities in Nagorno Karabakh, and constituted an absolute demographic majority on those lands. With the turmoil caused by the Syrian Civil War, several hundred Syrian-Armenian citizens have moved from Syria to Nagorno-Karabakh Republic. Many of these refugees are being offered assistance by the government in the form of land, housing, extra educational assistance, and other such basics that will help them quickly assimilate and start their new lives. As the civil war continues, many more families are expected to make the move to Nagorno-Karabakh. Ethnic Groups: The population of the Nagorno-Karabakh Republic is now almost exclusively Armenian. Almost all Azerbaijanis (41,000 at the territory of the Nagorno-Karabakh AO in 1989) have left the area. The majority of the Russians and Ukrainians have also left. 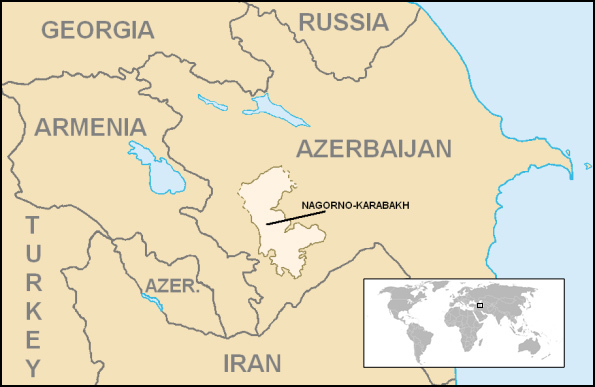 Languages: The main language spoken in Nagorno-Karabakh is Armenian; however, Karabakh Armenians speak a dialect of Armenian which is considerably different from that which is spoken in Armenia as it is layered with Russian, Turkish and Persian words. Religions: Most of the Armenian population is Christian and belongs to the Armenian Apostolic Church. Certain Orthodox Christian and Evangelical Christian denominations also exist; other religions include Judaism.